« Who is Going to Stand Up For Bullied Teachers? I always tell the parents of my students when they inquire about homework that it is NOT their job to do homework. They already had their lifetime supply of homework when they were a child. Why should they have to revisit primary school homework as an adult? I am expected to give homework as it is part of my school’s philosophy. Even so, I am very careful that the homework is merely a revision of what I am covering in class. There is nothing new and it’s certainly not a random worksheet designed to keep the students occupied. I then encourage my students to merely read their homework on the first night (they don’t have to actually begin it), and if there is anything they don’t understand, to circle it and let me know about it the next school day. Explaining the homework is NOT the responsibility of parents, it’s the responsibility of teachers. No parent should ever feel compelled to sit down and figure out their child’s schoolwork. The home is for quality family time not the stresses and arguments that occur when children rely on their parents to spoon feed them their homework answers. TEACHERS want parents to sign homework contracts so mums and dads acknowledge what is expected of them and their children. The age-old homework debate about what’s too much and what’s not enough has been thrust back into the spotlight after Federal Parliament set up an inquiry into teaching, including the “influence of family members”. Queensland Teachers’ Union president Kevin Bates said parents needed to be involved in their children’s after-school learning. It comes as the Australia Education Union president Angelo Gavrielatos has conceded homework had become a burden for some families who were struggling with modern life. 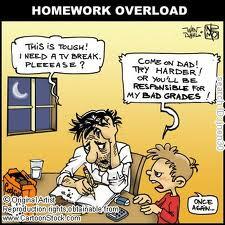 “There are growing levels of parental anxiety (with homework). Every parent wants their kids to have an edge,” Mr Gavrielatos said. He said some parents claimed their kids got too much and others wanted more. Some parents did homework for their children. Age-appropriate homework was proven to help children learn. However, schools with students from lower socio-economic backgrounds should get more government funding to help set up systems such as homework centres, he said. Queensland Education Minister John-Paul Langbroek said he understood how parents had become anxious about helping with their children’s schoolwork. “It’s our job to make sure we work with them and point out to them that your child doesn’t need to get everything right,” Mr Langbroek said. He said parents had complained to him, saying, “I’m not a teacher”. This entry was posted on October 7, 2012 at 3:03 pm and is filed under Homework. You can follow any responses to this entry through the RSS 2.0 feed. You can leave a response, or trackback from your own site.